Meeting Room 1, Tysons-Pimmet Regional Library, 7584 Leesburg Pike, Falls Church, VA.
At this meeting we will be reviewing a manuscript prepared by Greg Bayens. The members of the Family History Writers’ Special Interest Group would enjoy reading and reviewing your family narratives and help you to make them even better. We are all at different levels of writing skills and experience, and we enjoy helping each other. Whether questions of grammar, comma usage, spelling variations or those fiendish footnotes, we welcome the opportunity to discuss and debate the issues. 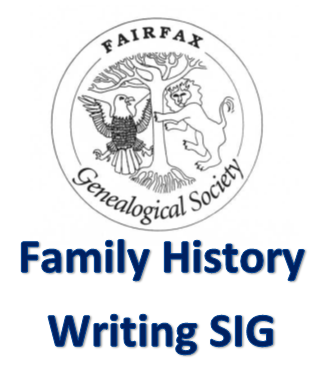 Come to the meeting and see how historical context can be incorporated in family history narratives. See how two stories can be told at once, placing the protagonist in the center of the action, adding suspense, injecting drama, and using dialogue to move the story forward. If you wish to be added to the members list and receive a copy of the draft manuscript by email, please send your name and email address to SIG co-leader Sean Furniss at Sean.Furniss@gmail.com. Meeting Room, Thomas Jefferson Library, 7415 Arlington Boulevard, Falls Church, VA. Please be sure to note the change in meeting location to the Thomas Jefferson Library. At this meeting we will be reviewing a manuscript prepared by Jeff Hume-Pratuch. At this meeting we will be reviewing a manuscript prepared by Deane Dierksen.